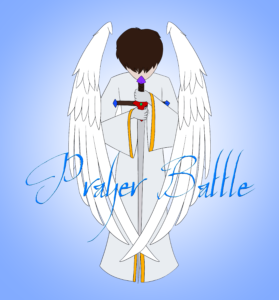 Yesterday Rivan worked on Prayer Battle for several hours. He did such great work! We have new functionality working on the buttons. I think in a couple of weeks, if we can keep this up, we will have the first release ready to publish! Of course, a lot of things can go wrong too, but if you will pray for us I am sure the Lord will help us to achieve this goal. Here is a sneak peek at what he was working on yesterday:ome of the graphics you may have seen before but the functionality is starting to work now and that is really exciting! 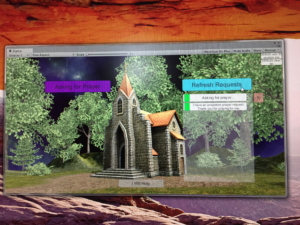 Some of the graphics you may have seen before but the functionality is starting to work now and that is really exciting! 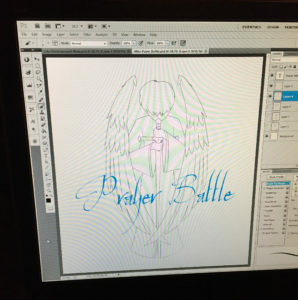 The other exciting thing is that Kaiya is working on a logo for us! I love the art she is creating. It’s going to be fantastic! Here is a little preview of what she is working on. I am excited about the work that was accomplished yesterday. I’m really proud of the work they did, it looks so promising! I think we’re actually going to get this done soon! I hope so. We need a success. It’s been so hard here. We need something to work. And I know there are a lot of people who need prayer. I think this app will be fantastic for helping connect people who need prayer to people who will pray. Big things are happening in the spiritual realm and it’s exciting to be a part of that! [EDIT 4:48 pm] Before I even finished working on the website today she finished the logo! And is now featured on our banner as well. We’re getting closer to release!